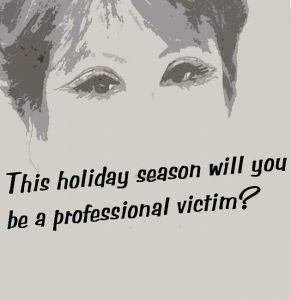 To take the professional victim test answer these questions. Leave your car unlocked in the driveway or in parking lots. Carry every credit card known to man when you shop. Leave your open purse in the grocery cart and walk away from it. Park in an unlit area of the mall and walk to your car by yourself. Walk around with ear buds in and the music blaring. Leave packages in your car where they can be seen. Leave your home unlocked at any time. Give out personal information over the phone. Answer YES to any of these questions and you are on your way to becoming a professional victim. Why? Thieves may gain access to your home by using your garage door opener and also get personal information from documents (car registration and insurance). Should your wallet be stolen the thief will have every card you own. Take only what you need for the day. Really? WTH? I see this all the time. Don’t_do_it. Also, while shopping keep your keys separate from your purse—like in a pocket. If thieves get your purse they have your home address, from ID, and the keys to get in. Don’t think I need to explain. You can always ask mall security to accompany you to your car. And have your keys in your hand ready to open the door. Always be aware of what’s going on around you. Always! Doesn’t make any difference if the car is locked. One good window bash and your packages are gone. Thieves walk neighborhoods looking for unlocked doors. Some carry packages as if they are making a delivery. Unless you KNOW the person asking questions don’t give out info over the phone. AND… the IRS NEVER calls asking for payments in the form of Target gift cards. Now, let’s talk about Credit Card Skimmers being used at ATMs, gas pumps and restaurants across the country. What is this credit card skimmer thing? It’s a device attached to the regular skimmer at a gas pump, ATM machine, or a hand held device that captures your card information and debit card pins in seconds. In minutes the thieves make a duplicate card then go on a spending spree at your expense. With your pin number they can access your bank account. YIKEES! Scary. Be cautious. Check the card reader you are about to use at a gas station. If pieces are a different color, it sticks out a bit, or it jiggles when you pull on it, this could be a skimmer. 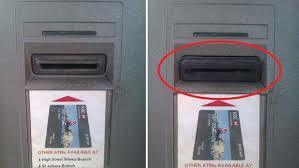 Most skimmers are placed on pumps that cannot be seen from inside the station. If your transaction takes a long time being approved there may be a more sophisticated skimmer inside the pump. Report this to the store immediately. Skimmers are also placed on ATMs especially those in dimly lit or out of the way areas. At an ATM, also check for a hidden camera. Thieves often place one in a position (up high) where it can capture PIN information as you punch it in.And finally it can happen when you pay in a restaurant. Restaurant workers are 99.99% honest, hardworking people. It only takes that one worker who disappears with your card and swipes it through a skimming device, to steal your info. Some have a card they only use for gas and dining. It has a low limit, enough to cover what you spend a month. Frequently check your account for unauthorized purchases. I found there are credit cards and banks that allow you to turn off the card for online purchases, ATMs, cash advances or balance transfers. Check with your CC company and bank to learn if they have this feature. I don’t know how this works but I’m doing to look into it. Bottom line is no one is 100% safe. You have a better chance taking a few simple steps. This holiday season please take care of your personal and financial safety. And Do Not Text or Drink and Drive. If you have any safety tips feel free to leave them in comments.